Praxis Coffee uses a 16:1 water to coffee ratio. First, bring your cold filtered water to 202° F. While your water is coming to a boil, go ahead and grind your Praxis coffee to a medium coarse grind (similar to table salt). 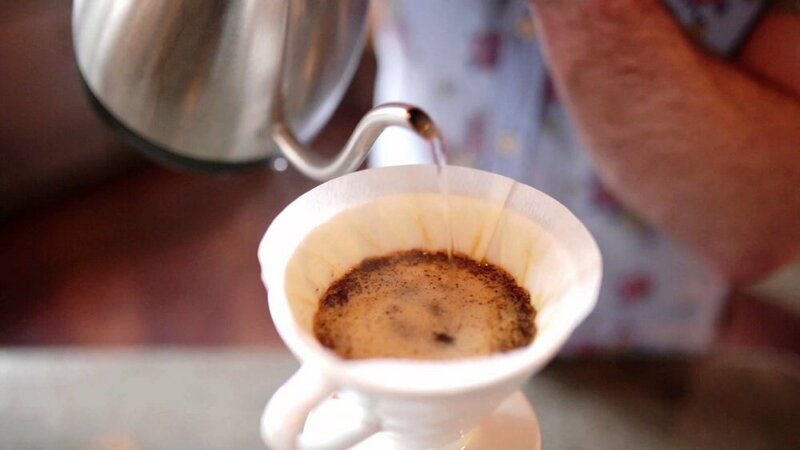 Fold your filter along the crease so that it fits snugly inside your V60 dripper. Then set the dripper on the range server. Once your water has reach 202° F, give your V60 filter a quick rinse to remove any paper taste that could end up in your cup and to preheat the glass range server. Dump your rinse water. Pour your ground coffee in the filter carefully so that it creates an ant mound in the center. In a circular motion, pour 30 g of water around the outside rim of your coffee bed where it meets the filter, leaving an ant mound of dry coffee in the middle; wait 25 seconds. After 25 seconds, begin on the outer rim again, and work your way into the middle of the filter slowly in a spiral motion, pouring the remaining water. You should finish pouring around 1:00 and your total brew time should be 2:00 - 2:30 minutes. If your brew time exceeds 2:30, try pouring faster or try a coarser grind setting. If your brew time is shorter than 1:45, slow your pour or use a finer grind setting.